Originally published under the title "Turkey Uncensored: A War On Journalism." 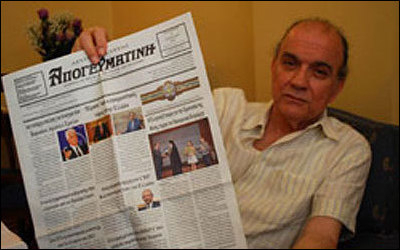 Mihail Vasiliadis, editor-in-chief of the last remaining Greek-language newspaper in Turkey, Apoyevmatini. Today, 167 journalists languish in Turkish jails, a figure reported by Turkey's Platform for Independent Journalism (P24). Many TV stations, news agencies, newspapers, magazines, radio stations and publishing houses have also been shut down under state of emergency decrees since last year's abortive coup. But pressures against the media are not a recent phenomenon in Turkey. It would not be an overstatement to say that since Turkey's 1923 founding, violent as well as non-violent attacks against newspapers and journalists have been the norm in the country. Many Turks – including journalists – have recently been trying to get away from the pressures and attacks of the Turkish government and have sought shelter in Greece, the country of the people that Turkey has exterminated in Anatolia. One is Turkish journalist Cevheri Güven, the former editor-in-chief of the magazine Nokta. After on-and-off stints in police custody, Güven fled to Greece in 2015 with his wife and two children. "People must understand: There is no justice in Turkey," Güven told AFP. Being targeted by their own government is a new experience for many Turks, but for Anatolian Greeks, being subjected to severe persecution and discrimination at the hands of the Turkish government and much of the Turkish public is a part of their daily lives. And apparently, the main victims of Turkey's intolerance of free exchange of ideas were the Greek-speaking journalists and Greek-language newspapers. Today, only one Greek-language newspaper remains in Turkey (and it faces closure): Apoyevmatini. The newspaper's editor-in-chief, Mihail Vasiliadis, said that there were approximately 120,000 Greeks in Istanbul during the 1930s and 1940s, at which time the newspaper had a circulation of 35,000. But there are now only 605 Greek families in the city, and 600 of those are Apoyevmatini subscribers. The offices of the paper, which was established in 1925, were closed down in October 2014 due to economic difficulties. Since then, Vasiliadis has been putting the paper together from his home – but he has had difficulty covering even the rent payments. Aside from Arabs, non-Muslim Ottoman citizens – including Greeks, Armenians, Jews and Bulgarians – ran their own empire-wide and regional newspapers and magazines. In 1908, 109 out of 726 magazines and newspapers that were allowed to be published were in Greek. Ekinci failed to focus on the real issue: What has happened to all those Greek newspapers and their journalists? First, let's look at the situation in two of the most culturally advanced cities in Ottoman Turkey – Constantinople (Istanbul) and Smyrna (Izmir). 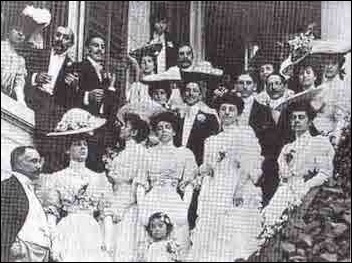 A 1905 Greek wedding in Constantinople. The Encyclopedia of the Hellenic World published a comprehensive article regarding the Greek-language newspapers in Ottoman Constantinople, describing the vivid and diverse Greek press in the city. "The strong presence of newspapers in Greek in Constantinople (Istanbul) during the 19th c. is closely related to the reestablishment of the religious communities in the middle of the 1830's and the beginning of the Tanzimat reforms (1839)," it said. But the current Greek population in Turkey is estimated at fewer than 2,000. Every violent or non-violent attack against the Greek-speaking residents of Turkey has brought the community one step closer to extinction. These incidents include, but are not limited to, the 1914–1923 Greek genocide, the 1941–1942 conscription of "the twenty classes" (an attempt to conscript all male non-Muslim populations, including the elderly and mentally ill, during World War II), the 1942 Wealth Tax, the anti-Greek pogrom of September 6–7, 1955 in Istanbul, and the forced expulsion of Greeks from Turkey in 1964. During the government-instigated pogrom in September 1955, Turkey's Greek-speaking Orthodox citizens in Istanbul was exposed to savage, devastating violence. Muslim Turks in the city attacked everything owned by Greeks – their homes, offices, businesses, cemeteries, churches and schools, among other things. In a 2007 article, Professor Alfred de Zayas wrote that the Istanbul pogrom "can be characterized as a 'crime against humanity' comparable in scope to the November 1938 Kristallnacht in Germany perpetrated by the Nazi authorities against Jewish civilians." Among the targets was also the Greek-language press of Istanbul. "The offices and printing presses of eight newspapers were destroyed," wrote author Speros Vryonis Jr. "All three principal dailies, the Apoyevmatini, the Tachydromos and the Embros, suffered heavy losses. The first two had both their offices and printing establishments completely wrecked. In the case of the Embros, only its offices were destroyed since it had no printing press of its own." Before the 1914–1923 Greek genocide in Smyrna, "Greeks had the dominant position, both in a demographic and economic level," wrote scholars Evangelia Boubougiatzi, Ifigenia Vamvakidou and Argyris Kyridis in their article Greeks' Identities in Smyrna, 19th – 20th Century Local and Global Parameters. One hundred thirty-five Greek newspapers and magazines circulated in Izmir during the period 1831 until 1922, compared to 16 Turkish, 34 Armenian, 12 Jewish, one Italian and 22 French-speaking, which were published by the Levantines, Greeks, Armenians and Jews. The Greeks, therefore, attached great importance to the Press for the preservation of the language and the promotion of Greek ideological, educational and cultural issues. The columnists consciously supported the civilizing penetration of Greek culture in Asia Minor. The Greeks of Smyrna, which is today termed "Izmir," were largely annihilated during the September 1922 fire that was started by Turkish military forces, which professor Lou Ureneck described as "the last violent episode in a 10-year holocaust that had killed 3 million people – Armenians, Greeks and Assyrians, all Christian minorities – on the Turkish subcontinent between 1912 and 1922." 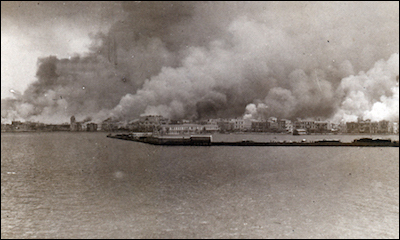 The Great Fire of Smyrna burned for over a week in September 1922. In addition, many properties belonging to Christians and Jews – such as printing presses and newspapers – have been seized by the Turkish government officials and private persons. "The newly established republican regime was based on the suffering of Armenians, their stolen property, and their rights and possessions," journalist Alin Ozinian wrote. "The law on abandoned properties was an excuse to seize other people's property, and Armenian assets in particular became the main basis of the republican regime. The property of the murdered Armenians was Turkified, along with Greek and Jewish properties." One would think that a holocaust would subdue the lust of perpetrators for Christian blood a little bit. But this was not the case. Even decades later, pressures on the Greek minority were rife, and free expression was still not a right enjoyed by Turkey's Greeks. The problems experienced by the Greek minority today include harassment by police; restrictions on freedom of expression; discrimination in education involving teachers, books and curriculum; restrictions on religious freedom; limitations on the right to control their charitable institutions; and the denial of ethnic identity. Two newspapers are printed in the Greek language in Istanbul; each has a circulation of 500 to 600 and consists of only about eight pages. Every day, according to members of the Greek community, these newspapers must submit five copies to the office of the governor of Istanbul. Neither newspaper is permitted to criticize the Turkish government. If a Turkish newspaper prints criticism of the government, the Greek newspapers cannot translate and publish the criticism for their readers. "I've been a journalist for 37 years," one Greek told Helsinki Watch. "I know what I can write and what I cannot." According to ethnic Greeks, the Turkish government does not permit newspapers or magazines published in Greece to be imported into the country, and no Greek books are available in bookstores. In spite of the Turkish government's denials, Helsinki Watch concluded that the Turkish government had seriously restricted the freedom of expression of the Greek community in Turkey in violation of international human rights laws and agreements. When the report came out, there were only about 2,500 Greeks in Turkey. 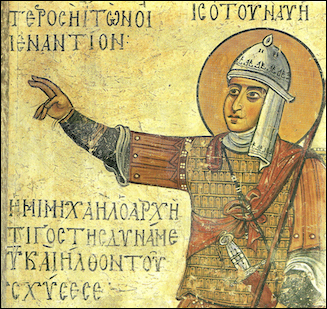 When Seljuk Turks from Central Asia invaded and began to conquer Asia Minor in 1071, the majority of the indigenous population of the region spoke Greek and were Greek Orthodox Christian. When Seljuk Turks began to conquer Asia Minor in 1071, the majority of the indigenous population were Greek-speaking Christians. Constantinople was founded by the Roman emperor Constantine I (324–337) and became the embodiment of the civilization of the Eastern Roman/Byzantine Empire. It was invaded and captured by the Ottomans in 1453 and renamed Istanbul by the Turkish government in 1930. Today, Greek-speaking Orthodox citizens are a dying minority in Turkey. "The number of those who speak Greek fluently as their native language and know the Greek culture well is just around 1,600," Vasiliadis said. "And their average of age is 60. Our young people have left Turkey. We do not have wedding or baptism ceremonies anymore. We only have funeral ceremonies." Today, the destruction of any remnant of the Greek culture that existed in Turkey is almost complete. Islamization and Turkification by the Turkish governments have, for all practical purposes, been accomplished in less than 100 years. Ethnic cleansing against Greeks in Turkey has been wildly "successful." The West, which largely owes its democracy to Greek civilization, simply looked away while all of this damage was being done to the Anatolian Greeks. The effects of the loss of Greek culture should be seen as a loss to humanity of historic proportions that could have easily been prevented by Western countries.